Suggested Fitting: Same as street. Men order 2 sizes larger. I recommend these students to my students and campers all the time since they are a solid good shoe and easy to fit. They aren't as durable as the more expensive and heavier shoes, but the sound is okay and we've been very pleased. I ordered about 10 pairs of these shoes for the dances in our school play. I read the other reviews, warning that the screws often got loose, and the same happened to me. I had to go through the entire team, and tighten the screws on the toe taps. One screw was even misplaced completely. That wasn't such a big deal though, but the real problem was when the sole started to rip up. The sole of the shoe right behind the toe tap peeled up, and we were unable to use those shoes. This happened to two shoes. This entire group of dancers are all beginners. We are not rough on the shoes at all, and this happened by just practising simple choreography. These complications began after only about 10-15 practices. On the bright side though, they are affordable, and look nice. If you have another pair to practice in, then these should work very well for a performance. I purchased these for a tap a class one semester and I must say they are true to sizing and extremely comfortable. However, the tap does occasionally come off, which can be screwed back in. So I wore these shoes for tap class 3 days after buying it, and they gave me blisters within 1 hour. The class was not intense because we were learning the placement of the piece we were doing, so if we were doing drills, it would have been painful!! It hurt the inside of my ankle even while standing, and I wasn't pronating into the shoe either. One week later, the blister still hasn't healed. If you plan on buying these shoes, wear socks while using them!! Adult Lace Up Tap Shoes. I won't go into the long backstory about why I'm so thrilled to have these shoes; suffice to say they FIT, and they got here in time for my class. Bless the U.S. Postal Service; UPS, FEDEX would have been here just after my class, at best. I will bear in mind the comments about loose screws and check mine after every class. Shoe fits pretty close to true size and seems to be durable for the price. Only complaint - there is a side seam on the side of the foot just below the ankle bone that really bothered my daughter when we tried these on, so these are being returned. I ordered a couple pairs of these for my students. Be fair warned that they will not last you more than a few months. This shoe would be great for a single performance and/or a dancer that taps less than once a week. But they are not durable and will not last you long. Bought these for my 15 year old daughter who has danced since age of four to be worn solely for a musical she is in at her high school. Due to the fact that she doesn't take a tap class, these will only be worn for rehearsals and the 4 shows that she is in. We felt that they were a good shoe for the price, but cannot speak to the overall durability of the shoe. She normally wears a size 10 and we purchased a 10.5 and they fit perfectly. Had to order a half size smaller than my street shoes and now they are a perfect fit. BTW, shipped quickly! Mixed reviews I'm reading for this shoe. Some say runs true to size and it says to buy "street size". My daughter wears a 3 in her "street shoes". So I purchased a 3, too small. Size 4, too small. I am now ordering a women's size 5. It has cost me $12 in shipping to return the other shoes. The first pair came from Anaheim, Ca. The second pair came from PA. since I live in CA it cost me double the $$ to return the second pair. I cannot rate or comment on durability since we have not had a chance to wear them. I'm really hoping for no further problems. My daughter's feet seem to grow very fast, so I thought I'd try these less expensive shoes. At first they seemed fine; the fit was accurate to her street-shoe size. They were a little stiff, though. She's worn them for a few months now and they haven't softened up at all. The plastic-y like material that the uppers are made of is very hard. The extra cushioning stitched in at the heel seemed like a great idea, but in fact it just adds extra bulk and actually cuts into her feet now causing little sores. Something about the toe fit isn't right either...they've caused a callus to form on the side of her left big toe. She was quite the trooper giving these shoes a huge try without complaining to me. Now I feel really terrible...who knew they hurt so bad :( In addition, the screws keep coming out of the taps, such that they won't screw back in. Keep in mind we've only had these a short time, and we had to super-glue the taps back on...not great for pretty-sounding tapping. On a positive note, the shoes still look new, even though they've been worn for a few months...the black surface is apparently very scuff resistant. Looking forward to spending a little more money for a much better shoe very soon. This shoes does exactly what I needed it to do and will be a good basic tap shoe. The lacing draws the shoe snugly around my foot with no slipping on the heel. I purchased these shoes for an Irish Dance class for beginners. They are great basic tap shoes and have served me well. The basic black shoes are clean and simple looking. They were exactly what I wanted at a great price. I bought nearly 20 pairs of these for our school dance classes (yes, 20). They were used approx 10 hrs per week for 4 weeks. Only about 40 hrs maximum, and on beginners doing basic material. At least 25% of the shoes starting losing screws by about halfway through. I'd say by the end almost 50% of the shoes needed repair to hold screws in (not just tightening). An excellent price but beware -- you get what you pay for. I got these shoes for my tap class, and they are wonderful. the tap sounds great and they are comfortable. also they do their job. my only problem is that the inside lining is ripping a little (not much) after having them for three months, but despite that they are still wonderful tap shoes! If my daughter wears a street size 3 what size should she order? I'm a bit confused. My 9 yr old wears a street size 3. Does this mean she would order an adult 5?? Yes, that is correct. The child size 3 is equivalent to a women's size 5. Hello! Thank you for contacting us. We recommend to order the size 9.0 or 9.5 for wide widths. Hello! Thank you for contacting us. The fitting suggestion for this item is for women to order the same as the street size or 1/2 size larger if you wear the wide width. And, for men, 2 to 2 1/2. Do these tap shoes have any leather? I am looking for a vegan-friendly pair of tap shoes. Was any leather used in the making of these shoes? Hello! Thank you for contacting us. Unfortunately, these are not considered vegan shoes but we are currently looking into adding more items to our catalog and we may carry vegan shoes in the near the future. I am the team mom for a small STEP team in Virginia. Many of the children are disadvantaged youth and cannot afford even this great price you are offering. 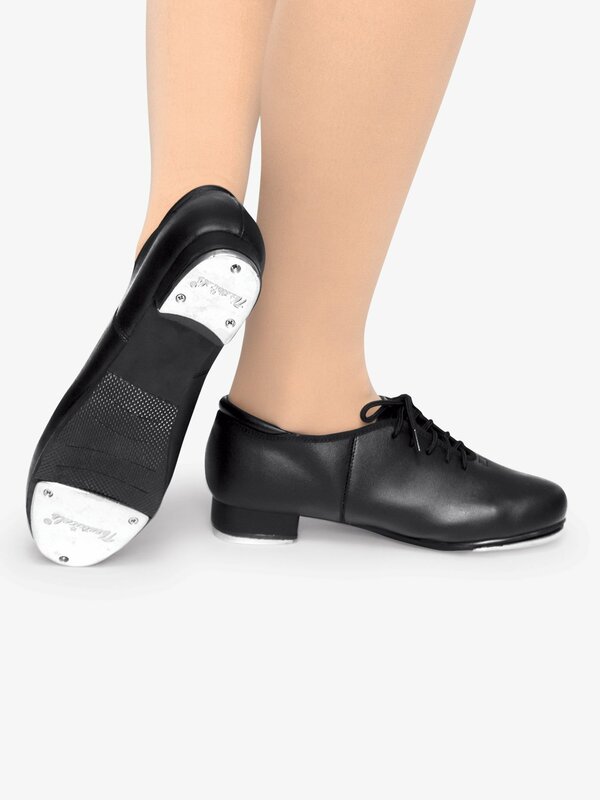 Do you have a discounted rate if we order over 10 pairs of these tap shoes? Unfortunately, we only have teacher accounts. If your teacher holds an account with us, you can have them place an order for the team. However, we do not have other team promotions. What is the difference between these and the Split Sole Tap Shoe (T9555)? Item T9555 is a split sole shoe and item T9500 is a full sole shoe. Can you unscrew any of the taps or are they permanent ? The taps can be adjusted as they are screwed on, but they are not meant to be completely removed. Does this shoe have a hard sole or a soft/flexible sole? The sole on this shoe is a hard full sole, not a split sole so it will not be very flexible. You would need to convert your daughter into an adult size by adding 2 sizes to her child street shoe size. This item states for both child and adult to order the same as street shoe size. Your daughter would need to purchase an adult size 5.0. I was wondering what men do for sizing I read that we should order 2 sizes bigger but when ordering the 'M' icon is there so I am wondering if that means it is in mens already? M would stand for Medium width and W is for wide width. You would still need to add two sizes to convert to mens size. I am not a dancer and know nothing about tap shoes. I'm shopping for a gift. Are these shoes unisex, or women only? If they are unisex, how would you suggest sizing for a men's size 8? This item can be unisex, Men would order 2 sizes larger than thier street shoe.